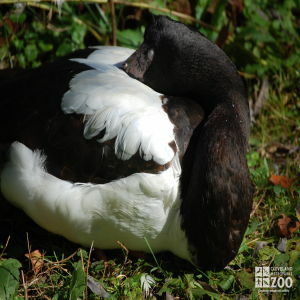 The range of the Magpie Goose is New Guinea and northern Australia. The Magpie Goose inhabits swamps and grasslands in floodplains of tropical rivers and are usually found not far from coasts. Magpie Geese are not truly migratory but wander extensively in relation to food and water availability. They are occasionally reported outside their normal range throughout much of Australia and even Tasmania, especially during the dry season. Magpie Geese are often polygamous, typically one male paired with two females. Breeding starts at the beginning of the wet season. They form fairly large colonies. The nest is a large floating mound of vegetation. Chicks have gray down, whiter below, with cinnamon head and neck. Fledging is at about 11 weeks. Sexual maturity is at 2 years in females, and 3 to 4 years in males. Breeding success can be markedly reduced by severe dry seasons and by predators. Nests are often destroyed by predators.